In most bankruptcy cases, you will be granted an automatic discharge from bankruptcy nine months after the date your bankruptcy starts, provided that the required duties have been successfully completed. An automatic discharge means that your Licensed Insolvency Trustee will produce an official legal document called a “Certificate of Discharge” which will state that you filed bankruptcy and that you are now officially released of any obligation to repay the debts dealt with (written-off) during the bankruptcy. If during the first nine months of your bankruptcy your income is above the Superintendent’s Monthly Income Standards, the period of bankruptcy may be extended by an additional 12 months, to 21 months in total. You would be eligible for automatic discharge once the 21-month period has passed, provided your surplus income is paid. If you have filed a bankruptcy before, this nine-month term is extended to 24 months total before you are eligible to receive an automatic discharge (release) from bankruptcy. If you have filed a bankruptcy previously and your income is above the Superintendent’s Monthly Income Standards, the period of bankruptcy is extended from 24 months to 36 months. 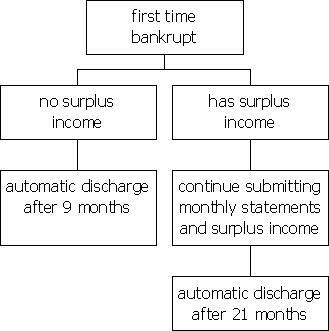 Eligibility for automatic discharge from bankruptcy after the end of the 36-month period. If you have surplus income, a Consumer Proposal may be a more suitable option than filing a personal bankruptcy. Watch our short video: Do I have enough surplus income to make a Consumer Proposal to creditors?